Today which proven technology must be used to manage queues and to deliver Key Indicator Performance in terms of dwell time, passenger flow and customer behavior analysis? Demands on terminal space have resulted in a greater need for improved methods of real-time passenger traffic measurement. Due to increasing traveler numbers and tight security constraints, airport passenger traffic is becoming increasingly inefficient. Passengers are spending more time waiting for check-in, luggage inspection and passport control. Managing passengers’ waiting time is crucial to improving airport business performance, allowing more time to be spent in inside retail and preventing costly delayed departures. Blue Eye Video provides technology that can count passengers and measure queue behavior, estimate waiting times at checkpoints, and report real-time metrics to airport staff through a data server. The provision of real-time data is a key element in ensuring that appropriate employees are deployed efficiently. The data helps managers make quicker decisions and enables them to react quickly to a rapidly changing situation. The performance of different queues can be compared and historical data can be used as an aid to resource planning by hour, day, week or month. Good passenger experience is essential in order to improve airport retail business profit. By reassuring the passenger with estimated waiting times and ensuring that queue flows are as smooth as possible, the passenger feels less stressed and is more likely to enjoy the airport experience. If the passenger is calm, they are more likely to spend time and money in stores, restaurants and entertainment areas, and they can take their time to purchase presents or refreshments without the anxiety of missing a flight. Blue Eye Video provides a wide range of solutions to help airports understand passenger flow and behavior. The company’s products include counting sensors, people counting software, queue measurement and passenger trajectory measurement, and database analysis tools. B-Top. This is an accurate bidirectional counting device with a vertical monitoring sensor placed over entrance and exit points and locations of specific interest. B-Queue. This provides direct and flexible queue counting, from 2.5m to 20m ceiling height, to enable coverage of any area. It gives an instant count of passengers waiting in a given area or in the entire field of view. B-Track. This is a tracking sensor, which records all pedestrian trajectories and can be used for accurate non-intrusive behavior measurement. These applications are implemented either in a traditional CCTV system or in Blue Eye Video’s smart camera with embedded software, known as a Video Counting Sensor (VCS). Service level agreement (SLA) compliance can be continually monitored to achieve optimum performance. Aéroports de Paris has been using Blue Eye Video queue monitoring solutions for the last three years and has demonstrated the value of improving SLA performance. Different leading European airports have separately evaluated different SLA data measurement technologies. Image processing solutions from Blue Eye Video were clearly ranked first, in comparison with Bluetooth or RFID technologies. According to these tests the BQueue product seemed to be the most relevant in airport cases. When queues prevent efficient passenger circulation or when public areas become overcrowded, B-Queue allows airport operators to manage the situation in two ways. First by allowing a real-time automatic alarm with video proof to be implemented, hence operation managers can be instantly alerted to a developing situation. Second, density heat maps can offer an overview of passenger density in different areas at different times of the day or during specific peak periods. With reliable information at hand, security and operation managers can easily understand and analyze the situation. Action plans can be implemented in order to optimize passenger flow and enhance passenger security level. 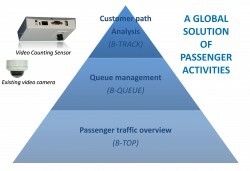 The B-Top solution allows retail operators to monitor passenger visits. The data from this can be used in two ways. First to optimize staffing levels according to customer density, and second it can be analyzed in relation with global airport revenue. Blue Eye Video provides solutions to help airport management anticipate traffic congestion problems and keep passenger traffic flowing as smoothly as possible. The company’s innovative measurement and monitoring systems can help reduce waiting times, optimize passenger flow and provide tools for better operator management. These solutions are not only more effective than existing manual-based methods but they also need fewer resources, have a very low effect on existing infrastructure and cost less for a better service.